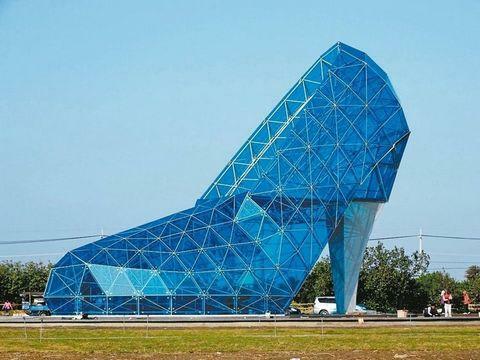 A church in Taiwan thinks it&apos;s figured out the perfect way to attract female worshippers—shape it like a high-heeled shoe. The towering 55-foot tall structure was completed by the Southwest Coast National Scenic Area in just two months. The unbelievable building is made out of 322 pieces of blue glass, making it look like you&apos;re stepping right into Cinderella&apos;s slipper. According to the Daily Mail, the church will also include 100 female-orientated features like a chairs for lovers so couples can take wedding photos, biscuits and cakes. While this seems like a pretty superficial way to entice female churchgoers, the design was inspired by a tradition that requires a bride to wear high-heels in order to shatter tiles and away the pieces before joining the groom’s family. It apparently signifies the start of a new life. It isn&apos;t exactly clear what type of church it is, but it&apos;s set to open next month.